Real time data analytics tools are the lifeblood of financial-services institutions. Trading analysis relies on rapid processing of real-time events occurring with nanosecond precision. 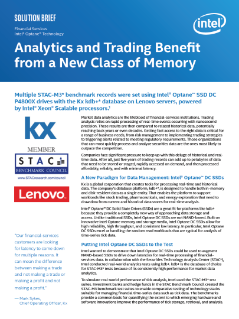 Recently Multiple STAC-M3* benchmark records were set using Intel® Optane™ SSD DC P4800X drives with the Kx kdb+* database on Lenovo servers, powered by Intel® Xeon® Scalable processors.